In 1997, this groundbreaking book made a powerful entrance into the national conversation on race. In a media landscape dominated by racially biased images of welfare queens and crack babies, Killing the Black Body exposed America’s systemic abuse of Black women’s bodies. From slave masters’ economic stake in bonded women’s fertility to government programs that coerced thousands of poor Black women into being sterilized as late as the 1970s, these abuses pointed to the degradation of Black motherhood—and the exclusion of Black women’s reproductive needs in mainstream feminist and civil rights agendas. 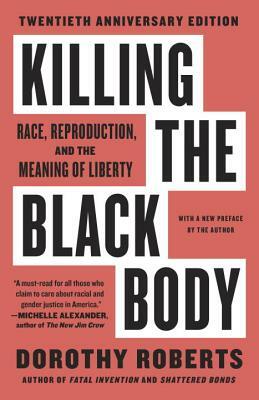 Now, some two decades later, Killing the Black Body has not only exerted profound influence, but also remains as crucial as ever—a rallying cry for education, awareness, and action on extending reproductive justice to all women. Dorothy Roberts is the George A. Weiss University Professorof Law and Sociology and the Raymond Pace and Sadie Tanner Mossell Alexander Professor of Civil Rights at the University of Pennsylvania. She is the author of three books of nonfiction, Killing the Black Body, Shattered Bonds, and Fatal Invention, and has coedited six works on constitutional law and gender. She lives in Philadelphia.